The stories we hear each day are portraits of pain and courage of people so desperate that they leave behind everything to flee torture, abuse, and possible death. We represent hundreds of asylum-seekers from throughout the world and immigrants who are unjustly detained. Here are just a few people PAIR has helped. “Irene,” a political activist from Uganda, was forced to flee her home country after she was targeted by government forces because she criticized the Museveni regime. She was arrested, detained, and brutally beaten by soldiers for daring to oppose the government. Irene fled Uganda and came to the U.S. where she connected with PAIR. She was matched with a team from Goodwin Procter, who helped her to win asylum. Even after winning her case, she was separated from her children for almost eight years. Irene’s pro bono attorneys and PAIR's Anita Sharma worked tirelessly to secure the travel of Irene’s children to the U.S. and finally bring the family a happy ending. 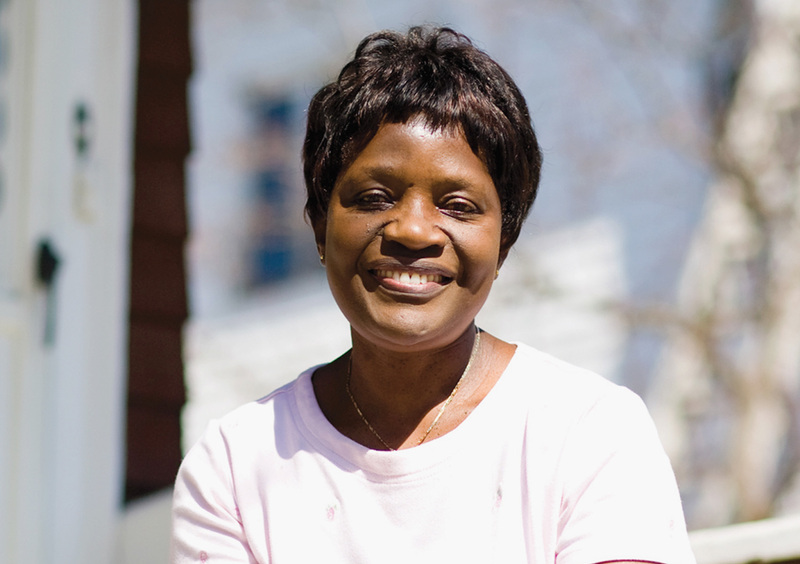 Irene is just one of the thousands of asylum-seekers PAIR has served over the past 28 years. Our effectiveness in providing legal representation so that they can build a safe future in the U.S. is possible because of our dedicated volunteers. Their support makes a profound, lasting difference in the lives of our clients. Octavio fled Honduras because he was repeatedly harassed, beaten, and assaulted due to his sexual orientation and his courageous work as a gay rights activist. He and friends formed a non-profit organization whose main responsibility was to document information related to rights abuses within the gay community such as police cruelty, maltreatment, and exploitation. Despite the risk, Octavio worked to protect the rights of the LGBT community. As a result, he was targeted by the police who threatened to harm him if he didn’t stop his activism. Soon after, he fled Honduras and came to the U.S. With the help of the PAIR’s Anita Sharma and his volunteer attorney from Burns & Levinson, he won asylum in the U.S. and continues to advocate for LGBT rights. Octavio is now a U.S. citizen, successful entrepreneur, a member of the PAIR Board, and a generous PAIR volunteer. “Zaroon,” an Internet activist who fled Syria after being targeted by secret police for his postings on Facebook protesting the Syrian government and their treatment of civilians caught in the civil war. With the help of PAIR and his volunteer team from Ropes & Gray, he won asylum in the U.S. and continues to advocate for democracy and freedom. “Edward,” an asylum-seeker from Uganda, fled abuse and torture at the hands of Ugandan government forces due to his sexual orientation and political beliefs. He was arrested and detained by government forces, during which time he was beaten, threatened with death, and tortured. With the help of friends, he came to the U.S. where he connected with PAIR and met his pro bono attorney, Nathaniel Bruhn, of Morgan Lewis. With Attorney Bruhn’s help, Edward applied for asylum and navigated the confusing and often frustrating immigration system. Edward won asylum before the Boston Asylum Office. He now resides in Massachusetts, rebuilding his life and working toward becoming a green-card holder. “Zara” was born in Ecuador where she faced severe harm, including, beating, bullying, and social isolation due to the fact that she is lesbian. She was even sent to a “correction facility,” where she was abused so that she would be “cured” of her homosexuality. One night, after closing her business, she was attacked by a group of men who targeted her due to her sexual orientation. Soon after, Zara fled to the U.S., where she connected with PAIR's Anita Sharma. With great courage and strength, Zara explained her case to an Asylum Officer and was granted asylum. Today, she has rebuilt her life, has her green card, is working full-time and dreams of opening her own business. “Zara” was born in Ecuador where she faced severe harm, including, beating, bullying, and social isolation due to the fact that she is lesbian. She was even sent to a “correction facility,” where she was abused so that she would be “cured” of her homosexuality. One night, after closing her business, she was attacked by a group of men who targeted her due to her sexual orientation. Soon after, Zara fled to the U.S., where she connected with a PAIR staff member who placed her with a pro bono attorney. With great courage and strength, Zara explained her case to an Asylum Officer and was granted asylum. Today, she has rebuilt her life, has her green card, is working full-time and dreams of opening her own business. “Eliana” is a transgender woman who fled El Salvador, where she faced severe harm, due to the way society viewed her. She never told her family that she had always felt she was born as the wrong gender. Eliana was also scared to tell her family or the police about the violence she faced because they might blame her and hurt her. Ultimately, she fled to the U.S. where she contacted a LGBT health clinic in Boston, who referred her to PAIR. With the help of her dedicated PAIR pro bono attorneys Natalie Kaminsky and Anita Sharma, Eliana was granted asylum. Today, she is able to live her life freely and openly as a woman. She has become a legal permanent resident and serves as a volunteer interpreter for PAIR. “Jeaninne” was targeted in the DRC due to her political activity and her father’s leadership role in an opposition political party. She was beaten, raped, and imprisoned for months before managing to escape and seek asylum in the U.S. After eight years and successful appeals to the Board of Immigration Appeals and the First Circuit, Jeannine finally won asylum before the Boston Immigration Judge, thanks to the perseverance of PAIR pro bono attorneys from Shapiro, Haber & Urmy. “Serav,” a medical doctor and former Deputy Health Commissioner of his hometown in Iraq, worked with several international NGOs and the U.S. Armed Forces on health-related projects to rebuild Iraq after the war. He was specifically targeted, attacked, and threatened with death because he was seen as a Western collaborator. He fled Iraq and came to the U.S to further his studies. Once here, he connected with PAIR. With the help of PAIR’s Anita Sharma, Serav applied for and was granted asylum relief. Today, Serav is a U.S. citizen; he and his wife have three beautiful children, and he is a successful endocrinologist. “Tomas”, was a victim of severe domestic abuse at the hands of his father in El Salvador. After years of abuse, he found the courage to flee for his life and made his way to the U.S. as a teenager, alone, only to face the prospect of deportation. Tomas was detained by immigration, but was lucky enough to have a bond hearing. PAIR connected him with a pro bono team from Mintz Levin. With the help of his legal team, Tomas won Special Immigrant Juvenile Status and the right to stay in this country— to live a life free from abuse, finish his education and become a productive member of his community. “Marjan” feared persecution in Iran due to her conversion to Christianity and her rejection of Islamic norms. Because conversion is illegal in Iran, she faced harm, including torture, imprisonment and death, if she were returned to Iran. With the dedication of her legal team from Foley & Lardner, Marjan won asylum in the U.S.
“Azi” is from Tanzanian. He is Pemban from Zanzibar, and was an active supporter of the Civic United Front (CUF), an opposition party. Due to his political activism, Azi was arrested, detained for three weeks, threatened, beaten, and tortured. He fled to the U.S. where he met with a PAIR staff member. Through the tireless work of his pro bono attorney from Goodwin Procter, Azi won asylum and has since reunited with his family in the U.S. He is now looking forward to opening his own business and to becoming a U.S. citizen. “Marie” is a young woman who fled her country in search of a safe haven because was a victim of severe domestic violence and abuse during her childhood in Haiti. Due to this trauma, she arrived in the U.S. with serious mental health challenges and fell victim to substance abuse, leading to trouble and ending up in immigration detention. PAIR staff met her at the Women’s Unit at the Bristol County House of Corrections, where she was detained by Immigration & Customs Enforcement, pending a deportation hearing in Immigration Court. PAIR accepted her case and placed her case with a dedicated team from Foley Hoag to represent her in Immigration Court. With the help of her attorneys and with great resilience in sharing her story, “Marie” was granted relief from deportation and released from detention. She now lives in a safe environment in Massachusetts with her family.